Whereas Canine Good Citizen tests are most often tested in a ring and situations are simulated (e.g., 3 helpers serve as a "crowd"), the AKC Community Canine test is done in real situations including at shows, classes, and in the community. AKC Approved CGC Evaluators administer the AKC Community Canine test. There is no age limit for dogs taking the AKC Community Canine test. However, before taking the test, dogs must have a Canine Good Citizen test on record at AKC. There are several exceptions to having no age limit at an AKC Community Canine test. When AKC Community Canine tests are given in conjunction with AKC events, clubs enforce the regulations for all activities. All tests must be performed on leash. Dogs should wear well-fitting buckle or slip collars (including martingales) or body harnesses. Body harnesses should not restrict the movement of the dog. Special training equipment such as pinch collars and head collars are not permitted. The leash should be made of either leather or fabric. Retractable leashes may not be used in the test. We recognize that special training collars may be valuable equipment in the beginning stages of dog training, however, we feel that dogs are ready to be tested after they have been transitioned to a slip or buckle collar (body harnesses are also acceptable). If an evaluator is teaching classes and does not feel comfortable with one of the permitted collars, students may be required to take the test in the type of collar used in class (as long as it is permitted by AKC for testing). If the test is advertised for the general public, all of the permitted collar types and body harnesses should be allowed in the test. 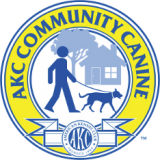 Test-giving organizations and individual evaluators may charge a fee for conducting an AKC Community Canine test. Fees are used to cover the costs of test kits, mailing, copying, and advertising related to the test. Private trainers sometimes charge a fee for a testing session that is commensurate with their hourly rate of service. There is a $20.00 processing fee that the dog owner will pay to the AKC for the AKC Community Canine title. Handlers are not permitted to use food as a reward during the AKC Community Canine Test. While we recognize that food can be an effective reinforcer during training, it should not be used in the test. As with CGC, the purpose of the AKC Community Canine test is to determine if the dog relates to the owner and if it can be controlled without food. Handlers may talk to their dogs and provide praise throughout the test. The test items should be in as natural, realistic format as possible. Evaluators should encourage the test to be fun. Evaluators may remind handlers to communicate with their dogs. Evaluators should not make the test easier by eliminating test items, nor should they require a higher level of performance than the test requires. Of course, evaluators may choose to teach more advanced skills in their classes. Dog walks past distraction dogs present; does not pull. This item may be tested along with #3 if there are dogs in the crowd, etc. "Leave it." Dog walks by food and follows owner instructions, "Leave it." This can be food placed by the evaluator on the floor or ground in a food dish with a wire cover as in Rally. Down or sit stay -- distance (owner's choice). Dog is on 20--ft line, owner walks away with back to dog, picks up an item (e.g., backpack, training bag, clipboard, folder etc.) placed on the floor/chair/ground by the evaluator and returns to the dog. Whichever method is used, the dog must not pull the owner and must be under good control. Think of the handler having the leash in one hand and a cup of coffee in the other. Doorway or gate can be real or simulated with ring gates, two chairs, or a natural passageway (e.g., entrance to trail) in the community.